Kale chips: tasty heaven in a leaf! Kale chips are essentially dried kale leaves with a flavour added then dehydrated or dried in a cool oven. The flavour and crispness is sublime! When I first came to look for raw and living food recipes, it was winter and I had grown a wonderful crop of kale. What could I do with it that was delicious and yet not cooked to within a millimeter of it’s green leafy life? I found a recipe for kale chips on a website by the raw Chef Russell James. I’ve made his recipe and many others since then. I love his recipe, but it is a bit sweet and heavily seasoned for my Aussie palate. Don’t be put off by the long ingredients list. It takes 3 minutes to prepare and is worth the flavour sensation. A large bunch of fresh kale. The bunch should be bigger than your head and choose any type of kale you like. 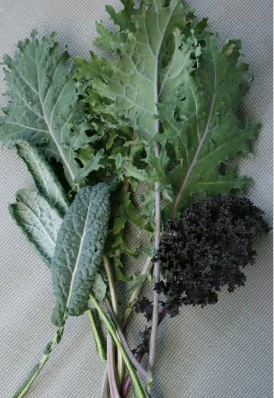 Cavolo nero, Tuscan Kale or Curly kale are probably best for their leaves that dry thicker. Wash the kale and tear the leaves from the stems. Set aside in a large bowl. Blend or food process the remaining ingredients until smooth. Scoop the sauciness into the bowl with the kale chips and with clean hands, massage the sauce through the kale leaves to coat each leaf. Now lay them in a single layer on dehydrator trays and dehydrate at 115F or 45C for 8-10 hours until the leaves have turned to crispy chips. ome out of the dehydrator. The smell alone will tempt you to pick at the drying chips, and they are so tempting. Don’t have a dehydrator? You can use your oven on its lowest setting or a solar dehydrator to dry the kale off. It may not take as long in the oven as a dehydrator. Check your oven doesn’t overheat and cook the chips. You may need to open the door to let out excess heat as they dry.